It is a sad irony that an organization founded in the wake of the Holocaust to prevent war and protect human rights now helps advance the cause of terrorist groups seeking to destroy the Jewish state. Yet officials at the United Nations do not blink when they direct all of their ire, all of their moral righteousness at Israel, the lone democracy in the Middle East—not at the world's belligerent, authoritarian regimes in Iran, North Korea, and elsewhere. The U.N. is now demanding that Jerusalem pay compensation for damage that Israel's military did to seven U.N. facilities in the Gaza Strip during the 2014 war between Hamas and Israel. "On 22 March, the U.N. submitted to the Ministry of Foreign Affairs of Israel a claim for reimbursement for the losses that the U.N. had sustained in seven incidents in 2014," U.N. spokesman Farhan Haq told the Jerusalem Post on Tuesday. The international organization "also submitted a claim for the losses sustained by the dependents of one of its staff members who was killed in one of the incidents," Haq said, adding that a U.N. board of inquiry, which finished its work in 2015, examined the matter and "found that the seven incidents in which U.N. premises were hit were all attributable to the IDF [Israel Defense Forces]." Israel's Mission to the U.N. said it received a demand for $528,725 for the facilities and $64,449 for the death. The U.N. demand is a moral outrage that ignores the facts. More importantly, it complements a cynical, malicious strategy that Israel's enemies use to undermine the Jewish state's legitimacy. The 2014 Gaza conflict broke out after Hamas—a terrorist organization whose founding charter calls for the destruction of Israel and the killing of Jews worldwide—used its network of terrorist tunnels to kidnap and murder three Israeli teenagers. Israel initiated an operation to find the teenagers, and Hamas launched rockets at Israeli cities and infrastructure. Israel then began Operation Protective Edge in July 2014 to stop the rocket fire and root out the tunnel network Hamas had created. 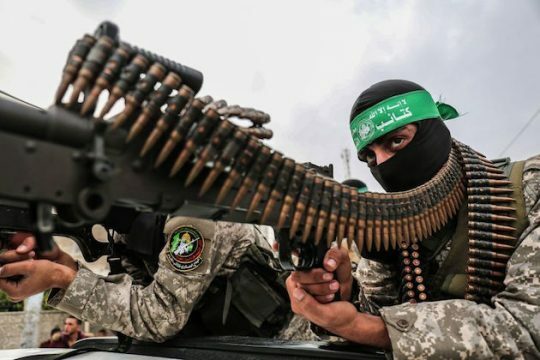 During the conflict, Hamas stored its weapons in hospitals and U.N. facilities, including schools, and fired weapons from those sites to attack Israel. The group even dug its tunnels underneath the U.N. schools. "The facilities had also served as emergency shelters for Palestinians in Gaza during the war, and as such, were supposed to be immune from IDF shelling," the Post noted. School was not in session at the time, but in at least one spot, Hamas unlocked the gate "in order to allow children access to the schoolyard," according to a 2015 U.N. report. The U.N. confirmed this information and still blamed Israel for civilian deaths in Gaza. The organization ignored the fact that the IDF took several measures to warn civilians if it planned to carry out operations where they were, such as dropping leaflets, making phone calls, and sending messages over television and radio, in which the Israelis detailed how to evacuate the area safely on a secure route. Hamas, however, told civilians to stay where they were, using human shields just as the Islamic State did in Iraq. The group's actions were part of an effort to try to force Israeli soldiers to kill Palestinian civilians and damage U.N. facilities in order to reach the weapons. Hamas knows it cannot defeat Israel militarily, so it uses an asymmetric strategy: make Israel look belligerent on the international stage to undermine the Jewish state politically and diplomatically. This PR effort provides fodder to the Boycott, Divestment, Sanctions movement and other anti-Israel initiatives, which strive to weaken, and often ultimately destroy, the Jewish state—primarily though de-legitimization. Unfortunately, Hamas knows the U.N. will oblige, introducing repeated resolutions that condemn Israeli "aggression," while treating the Jewish state's would-be destroyers as victims. But Hamas, as they say, is just the JV team. Hezbollah—the Iranian-backed terrorist organization based in Lebanon, with a similar mission to that of Hamas—is a much greater threat to Israel, possessing 100,000 to 150,000 rockets pointed at the Jewish state. A third Lebanon War between Israel and Hezbollah is simmering and could explode in the foreseeable future, given current trends in the Middle East. Such a conflict would be devastatingly destructive. Hezbollah, like Hamas, knows it cannot defeat Israel on the battlefield, so it similarly embeds its forces and weapons throughout civilian areas to force the IDF to kill innocents. Hezbollah used human shields during its 2006 war with Israel and, according to reports, plans to do so in a future fight. The Iranian proxy also "appears to be using environmental NGOs as a cover to create lookout posts and infrastructure that could be used to target Israeli forces," the Foundation for Defense of Democracies' Tyler Stapleton wrote last year. Israel is a small country with few vital areas that an enemy needs to target. If Hezbollah and Iran do trigger war, Jerusalem will have little choice but to immediately launch a major attack on Hezbollah inside Lebanon. Israel will do what it can to avoid civilian causalities, but Hezbollah will do what it can to put Lebanese innocents in harm's way, only then to use the media to portray Israel as the murderous party. Given its history, the U.N. will condemn Israel disproportionally for its actions in a third Lebanon war, regardless of the facts. As a matter of deterrence and smart public relations, Israel and other Western countries must "preempt" Hezbollah's smear campaign by explaining to the world what the group does to endanger civilians, how Israel will need to use decisive force if conflict begins, and how disastrous such a war would be for Hezbollah. These points must also be made at the U.N., which has been more helpful to Hamas and Hezbollah's strategy than any gun or bomb. This entry was posted in National Security and tagged Hamas, Hezbollah, Human Rights, Israel, United Nations. Bookmark the permalink.